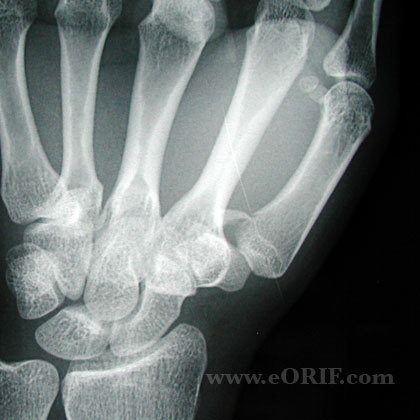 Intra-articular avulsion fracture of the volar-oblique ligament of the the thumb CMC joint. 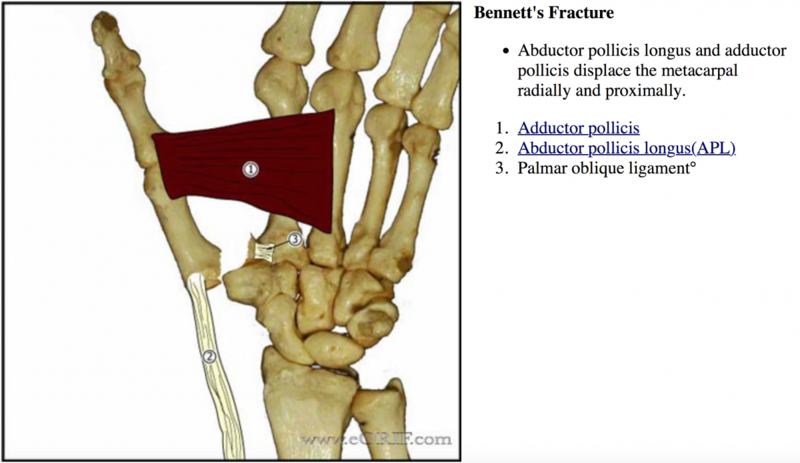 Abductor pollicis longus and adductor pollicis displace the metacarpal radially and proximally. 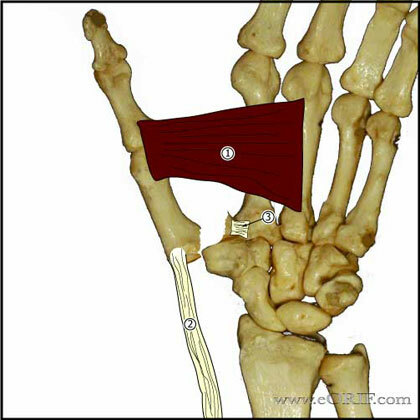 Bennett fragment is the volar-ulnar aspect of the metacarpal base. Pain, swelling, ecchymosis at the thumb MC base. P/A, lateral and oblique views of the thumb. True lateral view: palmar surface of the hand is placed flat on cassette; hand and wrist are pronated 15°-35° . Tube directed obliquely 15°distal-to-proximal, centered over the trapeziometacarpal joint (Billing L, Acta Radiol1952; 38:471). Bennett fragment < 20% of the articular surface: CRPP. Drill K-wire obliquely across the thumb the trapeziometacarpal joint while the the fracture is reduced by extending and pronating the metacarpal while longitudinal traction and downward pressure are applied to the metacarpal base. Bennett fragment>20% of the articular surface:ORIF. Wagner incision between the abductor pollicis longus and the thenar muscles, extended proximally and radially to the radial border of the flexor carpi radialis. Reflect thenar muscles subperiosteally, incise joint capsule. Debride hematoma from Fracture site. Reduce Fracture. Fix with 2.0- or 2.7-mm lag screw. >1mm malunion=arthritis. Consider conservative care for fractures with <2mm displacement, or patients with underlying advance arthritis. 6 Weeks: K-wire removal, begin ROM exercises provided union is evident on xray. 3 Months: Evaluated ROM. Sport specific rehab. Rivlin M, Fei W, Mudgal CS. 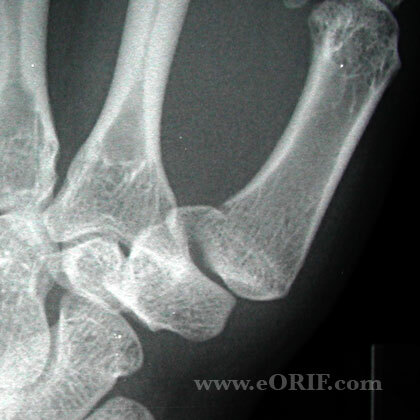 Bennett Fracture. J Hand Surg Am. 2015 Aug;40(8):1667-8. doi: 10.1016/j.jhsa.2015.05.017. Epub 2015 Jul 3. Carlsen BT, Moran SL. 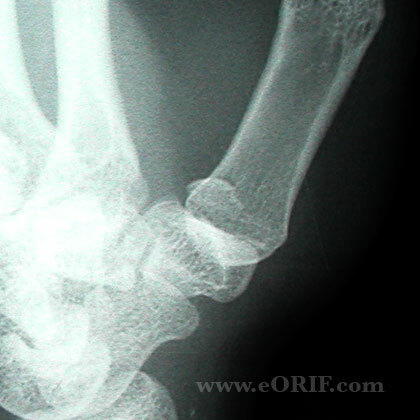 Thumb trauma: Bennett fractures, Rolando fractures, and ulnar collateral ligament injuries. J Hand Surg Am. 2009 May-Jun;34(5):945-52. Soyer AD. Fractures of the base of the first metacarpal: current treatment options. J Am Acad Orthop Surg. 1999 Nov-Dec;7(6):403-12.